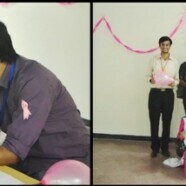 On 20 October 2014, the Senior Biology Society (SBS) arranged a Mock Pathology Lab to commemorate Pink Ribbon Day. The purpose of this activity was to raise awareness in the FCC community about breast cancer, as well as to encourage students of Biological Sciences and Biotechnology to come forward and work towards the development of better diagnostic tests for this disease. Microscopes were set up and the students could observe slides of normal breast cells and different kinds of cancer-affected cells of breast. Representatives from Chughtais Lahore Lab were also present to answer any queries of the students. SBS would like to extend its gratitude towards Dr Natasha Anwar for her immense contribution to this activity and Chughtais Lahore Lab for their continued support over the years.